ROCHESTER, Ind. 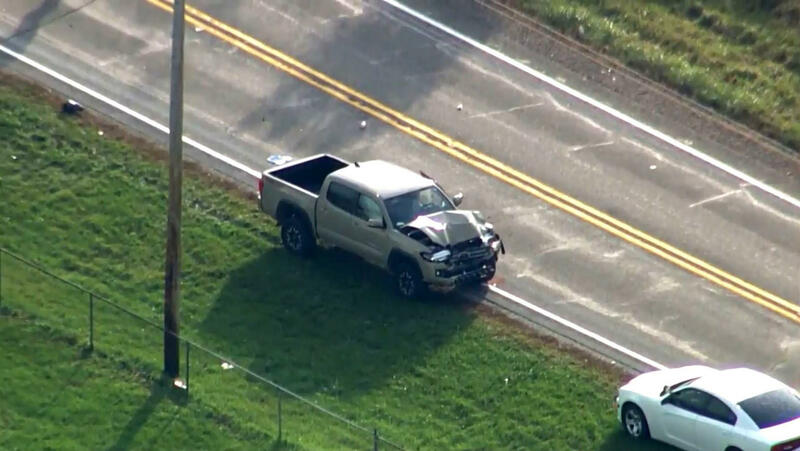 — A 9-year-old girl and her twin 6-year-old brothers were struck and killed by a pickup truck as they crossed a road to board a school bus in northern Indiana before sunrise Tuesday, police said. A fourth child was badly hurt and airlifted to a hospital. "I just can't imagine that pain," Indiana State Police Sgt. Tony Slocum told CBS affiliate WSBT-TV. "I haven't seen troopers cry in a long time, but I saw that today." A Tippecanoe Valley School Corp. bus — driven by Robert Reid, 46, of Claypool, Indiana — stopped and lowered its stop-arm on the road near Rochester around 7:15 a.m., just before a northbound 2017 Toyota Tacoma slammed into the children as they crossed the southbound lane, Slocum said. CBS affiliate WTTV reports no students were on the bus, according to the state police. Alivia Stahl, 9, and her 6-year-old brothers Xzavier and Mason Ingle died at the scene, and an 11-year-old boy who was also struck, Maverik Lowe, suffered multiple broken bones but spoke to emergency workers before he was airlifted to a hospital, Slocum said. Maverik was undergoing surgery in Fort Wayne. Slocum said Lowe was not related to the children who were killed. A GoFundMe page has been created to help his family with medical bills. At 6:35 p.m., Lowe's mother wrote on Facebook: "I just want to thank everyone for the thoughts and prayers and I'm sorry I can reply to everyone ... Maverik is in his third surgery and he is doing awesome he's definitely got this he's so tough and so strong." Slocum said authorities were interviewing the driver, 24-year-old Alyssa Shepherd of Rochester. Shepherd has been charged with three counts of reckless homicide, which are felonies, and one count of passing a school bus illegally, causing bodily harm, which is a misdemeanor, WSBT-TV reports. She was arrested at her business in Rochester and was being held in the Fulton County jail on a $15,000 surety bond. Indiana law requires motorists to stop when a school bus is picking up or dropping off children. The students had the right of way as they crossed the street from the rural mobile home community where they lived, Slocum said. The Tippecanoe Valley School Corp. said in a statement posted on Facebook that counselors had been dispatched to its schools to help students, staff and parents and urged "the community to come together to pray for the families." Detectives were interviewing witnesses and a crash reconstruction team was at the scene near Rochester, about 100 miles north of Indianapolis. Stahl and Ingle were students at Mentone Elementary School. Lowe attends Tippecanoe Valley Middle School, according to state police. Police said the Fulton County Sheriff's Department, the Rochester School Corporation, the Rochester and Mentone Fire Departments, Lutheran EMS and the Fulton County Coroner's Office were assisting at the scene. The National Transportation Safety Board is sending a team to investigate the crash. Indiana Gov. Eric Holcomb released a statement mourning the loss of the young lives. "Words cannot express the depth of sorrow Janet and I feel, which only pales in comparison to what family, friends, teachers, classmates and community are feeling right now," Holcomb said. "Today, and for many more to come, we mourn their loss. I ask Hoosiers around the state to join us by sending your deepest prayers for the strength needed to endure such a time."